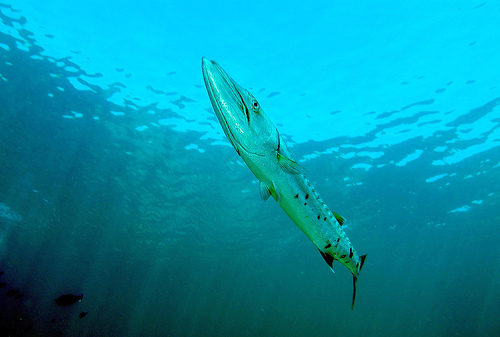 True Wild Life | Barracuda | The barracuda is a large species of fish found in the warmer, coastal regions of the world's oceans. 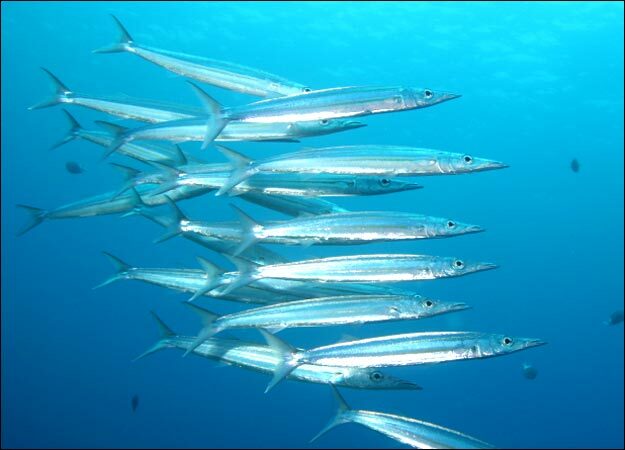 There are more than 20 different species of barracuda that range in size from less than 50cm to nearly 2 meters in length. The barracuda is widely spread across the oceans but is more commonly found in the more tropical regions where there is an abundance of food. Although barracudas can be found in the deep ocean, they tend to prefer coastal habitats along continental shelves and close to coral reefs. Despite the difference in size and colour between barracuda species, all species of barracuda have a similar elongated appearance, and pointed head with powerful jaws, containing rows of sharp fang-like teeth used for eating larger prey. The barracuda is known to be an aggressive and dominant predator, often relying on the surprise tactic in order to catch it's prey. Barracudas are also able to swim at over 40 km/h in short bursts which they do to overtake prey that may be trying to swim away. The barracuda is an opportunistic predator, feeding only on other animals in the surrounding water. 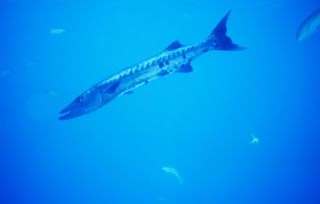 The carnivorous barracuda primarily feeds on smaller species of fish, marine invertebrates, crustaceans and squid, which the barracuda usually ambushes with tremendous power. Due to the fact that barracudas can grow into very large sized fish, the barracuda has few natural predators in the ocean besides sharks and killer whales. 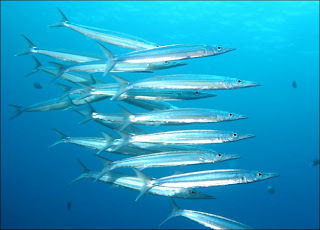 Humans are also one of the barracuda's main predators as they are hunted and eaten all around the world. Although little is really known about the reproduction of the barracuda, female barracuda are known to spawn during the spring. The female barracuda releases her eggs into the water which are then fertilised externally. 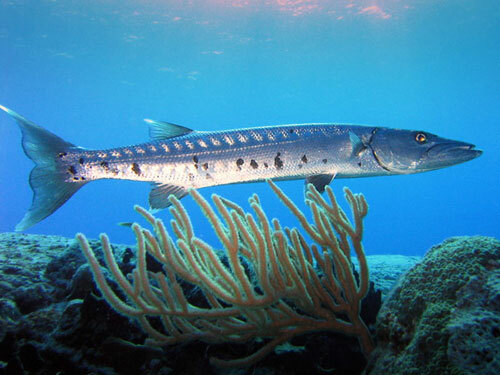 As with many fish species, once spawned, the barracuda mother has no interest in caring for her young. Today, due to it's aggressive nature, the barracuda is one of the most dominant predators within it's coastal environments and has even been known to act aggressively towards humans diving or snorkelling in the water.